As a close look at liberal and upper-middle-class mores, Silas Howard’s Brooklyn-set indie drama A Kid Like Jake seethes with potential. 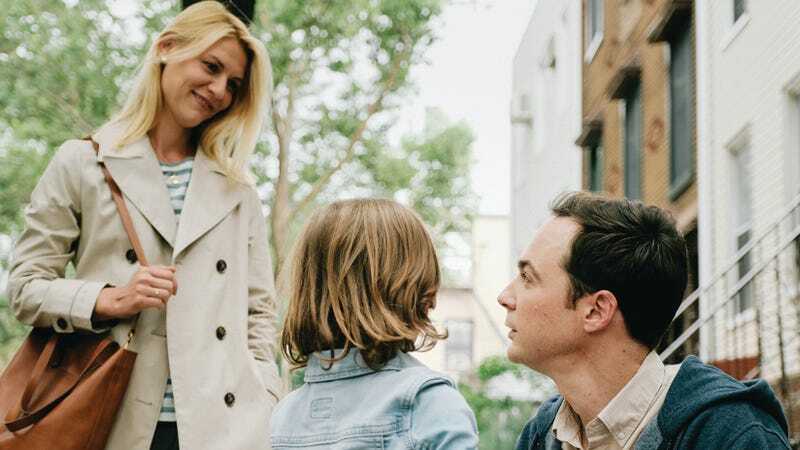 Alex (Claire Danes) and Greg Wheeler (Jim Parsons) are, on the surface, a happily married couple. He is a therapist with a small practice (we only ever see one client in his office); she is a former attorney who left law to become a stay-at-home mom, to the disappointment of her own mother (Ann Dowd), who never misses a chance to voice passive-aggressive disapproval at Alex’s decision. (That said decision is a direct reaction to Alex’s upbringing is an obvious point.) Ostensibly, the Wheelers’ lives revolve around their son, Jake (Leo James Davis), a typically quirky 4-year-old. But after the neighborhood they moved to with the sole purpose of getting their son into a top-ranked public school is rezoned, they find themselves faced with different options, including private schools they never planned to afford. Their friendly preschool director, Judy (Octavia Spencer), floats the idea of financial aid, suggesting, with extreme politesse, that their application should mention Jake’s “gender-expansive play”—that is, his preference for playing with girls over boys and wearing skirts and princess tiaras while acting out The Little Mermaid. Howard’s uneven and pedestrian commercial-meets-single-camera-sitcom direction tries to compensate for the extreme staginess of the script, which was adapted by Daniel Pearle from his same-titled play. The plot is all about language—with the toddler and preschooler commandment to “use your words” ironically contrasted with a grown-up’s tricky unwillingness to say what they mean—but its visual counterpoint never gets more sophisticated than a close-up of a wedding band being fiddled with. Its dilemma is one of parents being asked to define children who are too young to properly express themselves, with clear parallels to Alex’s relationship to her overbearing mom. Less clear parallels are provided by Greg’s sessions with a neurotically talkative client (Amy Landecker), and by a running gag that has him sharing a non-soundproofed wall with a colleague who practices Art Janov’s primal scream therapy; the punchline of the latter deserves better than it gets here. Like most parents, the Wheelers believe that their child is special, but not that special. While Pearle’s dialogue errs on the side of unnatural and expository overstatement (“I went to the public school that we are zoned for now” wouldn’t even sound convincing coming from a robot), it’s wise to the ways a relationship makes a comfort zone out of the unsaid, and is thrown out of whack by an invasion of new terms. The character of Jake remains unseen in the original play, and could just as well have been kept off screen here. Because there are more corrosive tensions waiting behind the movie’s extraneous one-note characters and its superficial jabs at progressive manners, birthday party etiquette, and parents jockeying to get their kids into the best schools. But if Howard and Pearle’s idea was to show how an extended argument devolves into the worst values of a previous generation—lashing out with implicit homophobia, resentment, and misogyny in the film’s shouty, snotty, excessively busy final third—then it comes too late here, before being patly resolved. A sharper drama would have made it the focus.